FLOAT in Anne Carley's hands is a wonderful key to a whole system of helpful tools, insights, and strategies to get you over that initial (and often repeating) hump. It was great to read inspiration from published authors, and use the multiple indexes for easy navigation and reference. Highly recommended for budding, unpublished, and published authors alike! Join A M Carley's mailing list and get your free FLOAT Preview. Here’s my recent post from BACCALiterary – the website of my writer group. It’s a mixture of a little writing, a little publishing, a little politics. Stir and bake at 350F for 30 minutes. OK maybe not that last part. I recently published my first book. Well, the first book that I actually wrote. For work, I help authors get their books published on the regular. This was my own book though, which made the experience slightly different. Noting the differences between my experience of other people’s books and my own was meta enough, thank you, and yet there was a further complication. 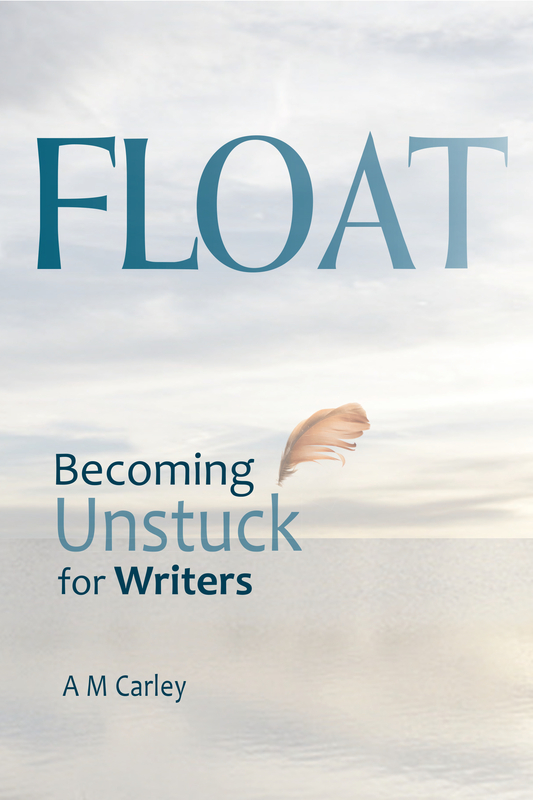 The book I wrote is called FLOAT • Becoming Unstuck for Writers. Which presumes that I know a few things on the topic. That’s true. I’m glad to report that I still feel competent to have written it. The difficulties came when the process of launching this book encountered, well, stuckness. You know, the stuff I’m supposed to know about extricating from. I want to paint an accurate picture. And to be sure, wonderful things happened. Some great opportunities arose, surprising me with bounties of time (a client needed to postpone our work, due to a personal emergency) and space (a last-minute chance to hide out at a writer’s retreat one long weekend enabled me to put the finishing touches on the manuscript before sending it to the copyeditor). Beta readers were generous and attentive and incredibly helpful. I rejoiced. This was going to work out fine! Even with a full-time job, I was going to be able to stick to my production schedule and get this puppy out in October, as planned. Then the copyeditor also had an emergency. It was a critically serious one, and needed to be honored. As long as it took for things to get back on an even keel, that’s how long the delay would be. Then the US political environment took an unexpected turn and I found myself grappling with past trauma I had not expected to need to look at any more in this lifetime. Time, effort, and therapy were required to deal with the reawakened monsters in the shadows. As long as it was going to take, I realized, that’s how long the delay would be. No negotiation was possible with myself on this stuff. I needed to feel safe walking down the street again before becoming capable of glad-handing strangers about the merits of my new book. Releasing the book in October simply wasn’t going to happen. OK. I readjusted my sights, and planned for early- to mid-November. Speaking of the US political scene, during that timeframe, the news reported that a candidate had won the national election. Suddenly, releasing a book about becoming unstuck felt ridiculously insufficient. And besides, who was going to want to buy such a thing? As if a craft book for writers was going to make a difference to anyone. More reflection, more therapy, more conversations with trusted friends. A growing sense emerged that we each need to focus on doing what we do well, as the best form of resistance, to become forces for positive change. I wrapped my brain around that notion and decided to publish as soon as possible. Independent publishers like my company often rely on the combined forces of CreateSpace and Amazon Kindle Direct Publishing – both parts of the Amazon empire – to take the completed book files and turn them into paperbacks (CreateSpace) and Kindle-compatible ebooks (KDP). So when CreateSpace delayed my publication date, and KDP refused to accept my formatted ebook file, a great welling of frustration, a sense of stuckness, you might call it, once again invaded my happy plans for book launch. In neither case was it a serious problem. Eventually, the paperback did become available (there had been a backlog of orders at CreateSpace), and the ebook file was accepted (KDP had changed its web form, so I needed to re-start the ebook setup process). Four local authors: A M Carley (left) signs her book for Zack Bonnie (right) while Mary Buford Hitz and Bethany Carlson talk about publishing. 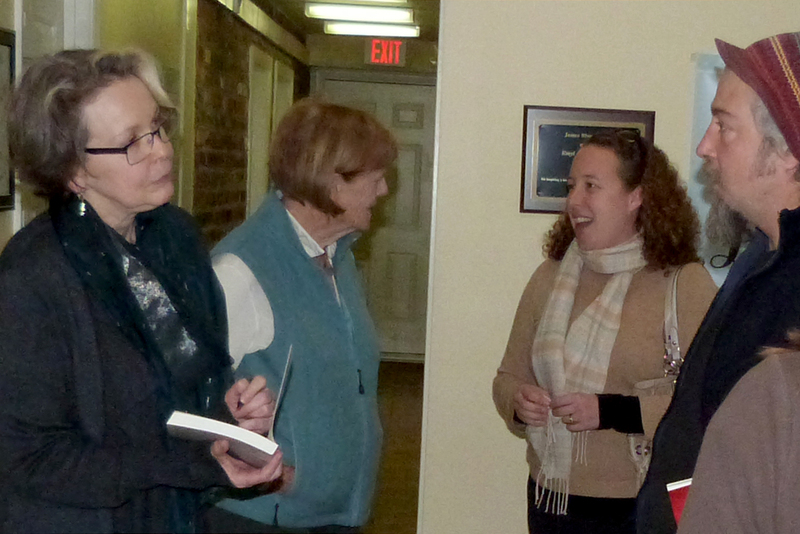 The book was available from Amazon by the last day of November, and I had plenty of copies on hand in time for my first book event, a soft-launch celebration as part of the twelve-author local writers holiday reception and signing at WriterHouse in Charlottesville, VA. And people bought copies of my book! Instead of being bummed out that I missed my October launch date, I decided to focus on the New Year, and appeal to writers who need a boost so they start off January with energy and focus. I’m offering a free course for writers who buy the book. That way, they can create their own accomplishments and a-ha moments during the first month of 2017. What have I learned from these periods of stuckness? “Circumstances beyond our control” can be affected by our behavior and attitude, anyway. Sometimes the schedule must change. Accepting that reality can create new opportunities. Putting one foot in front of the other, being doggedly purposeful, will often see you through to completion of the next step. There’s always a next step. This post is reproduced from BACCALiterary.com where it originally appeared. This entry was posted in Writing and tagged #BecomingUnstuck, AM Carley, BACCALiterary, Bethany Carlson, FLOAT, Mary Buford Hitz, politics, publishing, stuckness, WriterHouse, writing, Zack Bonnie on 19 December 2016 by AM Carley. Collectors and Collections: Why Do They Do It?